We have some exciting news to share today about our popular real estate website. Our new mobile search platform will be unveiled in 23 more days, and you are going to love it. It seems like just last week we announced the upgrade in technology on manausa.com, but that was more than 3 years ago (which is a really long time in both dog years and web technology). The primary reason for the change in 2014 was a major enhancement to our property search technology, and here we are three years later doing the same thing. But this time, the home search changes are related to mobile devices and speed. We have as many as 1,000 people each day using our property search tool, and they have always been grateful that we serve up timely, accurate information. But we have known for more than a year our platform was not the best for mobile technology, and this is the primary impetus for the new changes. 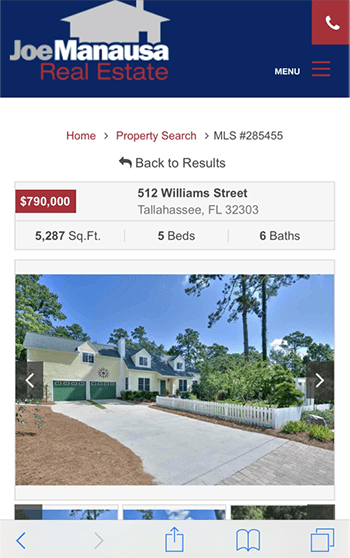 Our real estate website redesign delivers a fully responsive and optimized solution from the ground up to load fast and serve up only the active listings available in the Tallahassee real estate market. This means you enjoy the absolute best property search tool, whether using your phone, a tablet, a laptop, or even a desktop computer. Manausa.com will continue to differentiate itself from other local real estate websites with great content and information on neighborhoods, developments and communities in the Tallahassee area. This includes listings, statistics, testimonials, videos, blog posts and more, and you get to choose whether you just want to look at pictures of homes, or if you want a complete analysis of the real estate market in Tallahassee. The Tallahassee Real Estate Blog will continue to include an RSS feed so that our thousands of subscribers can continue to receive content delivered each morning to their email inboxes. Our new video management tool shows listing videos (including Matterport 3D videos) and will be included in the photo carousel on each of our property listing detail pages. If you like complete immersive walk-throughs, you will love our new website! For our readers who have not yet experienced an immersive 3D experience, you can go here to get a taste of what's to come. The new changes will take place on 10/18/2017 and we look forward to your feedback and experiences.